It was brought north for Helensburgh Heritage Trust’s month-long exhibition to mark the 150th anniversary of the opening of the Glasgow, Dumbarton and Helensburgh Railway, which was open to the public free of charge throughout May. The proud owner is Andrew Dow from Newton-on-Ouse, York, ex-director of the Railway Museum at York, who opened the exhibition at a private view. He is a director of Fastline Films Ltd. and the Gresley Society Trust Ltd., president of the Stephenson Locomotive Society, vice-president of the Great Central Railway Society and the British Overseas Historical Trust, a trustee of the Darlington Railway Museum, and the compiler of Dow's Dictionary of Railway Quotations. 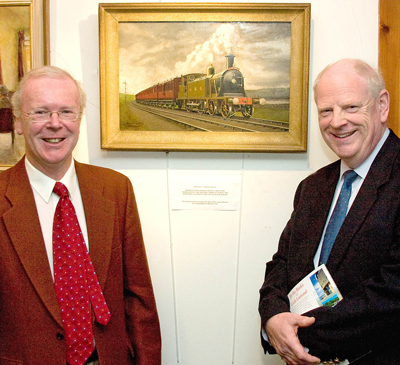 Mr Dow is pictured with exhibition organiser Stewart Noble (left), the Heritage Trust chairman.